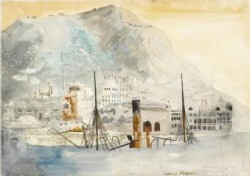 HF: These paintings and photos of Hong Kong soon after the end of the War are from the Imperial War Museum’s, (IWM) UK extensive collection of Hong Kong. I have selected them because they show some aspect of the industrial history of HK at this time. 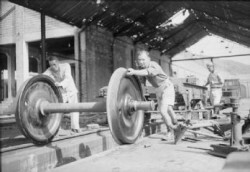 Either through the Naval Dockyard, Shipping wrecks in the Harbour (with close connections to post-war ship breaking) and the Kowloon – Canton railway. Further information regarding the people mentioned below would be welcomed. The captions have been added by the IWM. 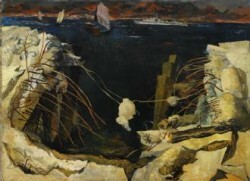 The paintings are by Leonard Rosoman who was appointed in April 1945, by the War Artists’ Advisory Committee, to a full-time salaried position to document the activities of the British Pacific Fleet. All images are copyright of the Imperial War Museum, UK (IWM) www.iwm.org.uk but can be published by IWM’s Non-Commercial Licence. Royal Air Force personnel work to repair an engine for the Kowloon Railway, Hong Kong. 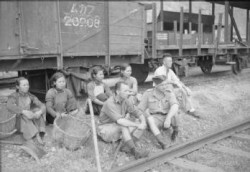 This railway was immobilised during the Japanese occupation, services were restored under Royal Air Force supervision after the liberation. 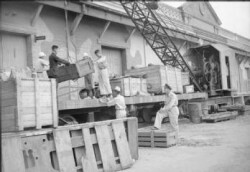 Flying Officer Herbert Lees DFC directs Chinese labourers and Japanese prisoners of war in the loading of goods on flatbed trucks of the Kowloon Railway, Hong Kong. 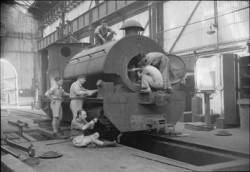 Leading Aircraftman L Moulden, a former blacksmith, helps roll a newly repaired bogey unit for a carriage or flatbed truck into place at the Kowloon Railway’s repair sheds, Hong Kong. Corporal J Masterton and Leading Aircraftman L Moulden pause with a group of Chinese women carriage cleaners to watch a newly repaired engine of the Kowloon Railway on a test run in Hong Kong. 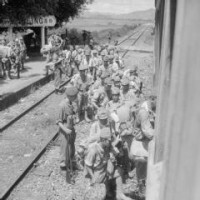 Japanese soldiers who were rounded up in the Fan Ling district of Hong Kong by men of the 3rd Commando Brigade are put aboard a train bound for Kowloon. This article was first posted on 4th January 2014.